Also called "northern pitcher plant," the unusual specimen in our photo goes by the botanical name of Sarracenia purpurea subsp. purpurea. Another subspecies does exist (see below), but we will limit our remarks mainly to subsp. purpurea, since this is the type that we grow. It is classified as a perennial. What Does Purple Pitcher Plant Look Like? We'll begin our description with the flowers before we move on to the namesake "pitchers." Each mature plant produces a single, 3-inch, flower. Like Mayapple, this plant is a fun one to observe as it progresses through the spring season. In Mayapple's case, it's the unfurling of the leaves that provide the most entertainment; with purple pitcher plant, by contrast, it's the evolution of the flowers that you'll want to observe closely. The developments described below play out over the course of the months of May and June here in planting zone 5. Before it opens, the flower of purple pitcher plant is simply a dark red ball perched atop a leafless stalk. The ball shape is reminiscent of the blooms of yellow pond lilies ( Nuphar lutea) before those iconic water plants are fully in flower. We find the flowers (not only of the purple pitcher plant but also of the yellow pond lily, for that matter) quite attractive even in this unopened state. When the flower first opens, its head nods fully downwards. The dominant color scheme is purple and red. Specifically, 5 purplish-red sepals crown the head, under which hang 5 petals of a lighter red color. Both the sepals and the petals curve inwards toward the flower's center. Because of the flower's nodding habit, only the sepals may be noticeable (as in our picture) at first, unless you get down on all fours and look up into flower. Soon, however, the petals drop off, and the flower picks its head up a bit so that the observer can better perceive what's going on underneath those sepals. What you'll see down there at this stage are the pistillate and staminate plant parts: i.e., the Holy of Holies of the plant's reproductive system. This includes a light green female part called a "style," which is quite large in this case and forms the bottom part of the flower. It too curves inward toward the flower's center and is 5-pointed, looking like some great shield positioned so as to protect the more delicate plant parts within. Ensconced between the sepals above and the style below in this unusual plant sandwich are the ovary and the yellowish, pollen-bearing stamens. As June wears on, the deep coloration of the sepals fades. This fading reduces the flower's aesthetic value, unfortunately, although it will remain an attraction for anyone with an eye for curiosities. 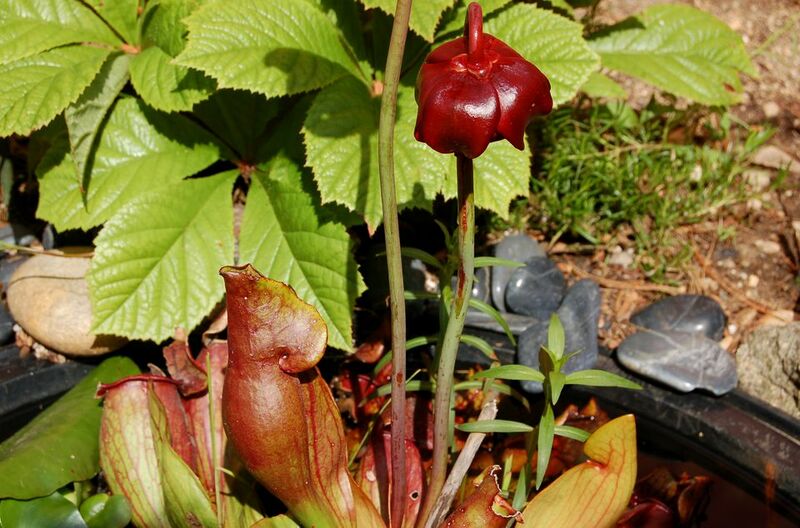 Indeed, We place pitcher plant on our list of the 10 plants most fun to grow, thanks to all the intriguing changes it undergoes. The "pitchers" referenced in the common name for this plant are really modified leaves. A rosette of these leaves radiates out from the base of the flower stalk; the pitchers can grow to be 8 inches long. They start out green, with purple or red veining. Mine stays mainly green (although the colorful veins also remain visible) throughout much of the summer; as summer grows long in the tooth, the pitchers take on more and more reddish-purple coloration. Decorative to the human eye, the pitcher shape does also serve a practical purpose (see below). Purple pitcher plant stands 20 inches tall when in bloom. Purple pitcher plant is native primarily to eastern and north-central North America. It can be found up and down the Atlantic coast. This species requires full sun. Ladd (North Woods Wildflowers, p.62) describes the plant as common "in saturated sphagnum mats in bogs, tamarack swamps, and peaty areas, in both acidic and alkaline wetlands...."
Subsp.purpurea is the more cold-hardy (to zone 3) of the two and can be thought of as the northern pitcher plant (one of its common names). Its southerly terminus is zone 7. Northwards, it extends well into Canada. The range of subsp. venosa is primarily zones 7-9. The ranges of the two subspecies intersect around Maryland (zone 7). Purple pitcher plants spread both via seeds and rhizomes, forming colonies. We can ascribe the "purple" in the name to either the deep red flower or the coloration in the pitchers. As for the name, "pitchers," this refers to the unusual shape of the leaf, which somewhat resembles a pitcher. Indeed, it is sufficiently container-like to hold water, wherein the prey of this carnivorous plant (see below) is drowned. According to the University of Illinois, there are several other species of Sarracenia in the U.S., but— with the exception of S. purpurea—all "are native to the Coastal States of the Southeast, ranging from Alabama to the Carolinas." The same source notes that the Old World equivalent to Sarracenia is Nepenthes, a native of the tropics. As noted above, purple pitcher plants are carnivorous. Why would a plant resort to eating meat? Well, the bog environment in which they grow in the wild is nutrient-poor, so the plants need to supplement their diets with food beyond what their roots can pull up. That's why their leaves have been modified into pitchers. The pitchers, which become partially filled with rainwater, function as traps. Insects and other small creatures are lured to them by their color and smell. It's easy for a bug to descend into a pitcher, but hard for it to exit because the internal walls are waxy (and therefore slippery) and covered in rigid hairs that point in only one direction: downwards. Faced with having to climb out "against the grain," as it were, victims end up tiring and dropping to the bottom of their leafy prison, where they drown in the rainwater. Nutrients from the decayed bodies are eventually absorbed by the plants. To use purple pitcher plant in your landscaping, take your cue from its natural habitat. It is a wet-area plant, so you'll most likely want to use it in a bog garden, damp swale, rain garden, or at the edge of a water feature. We placed our own plants, which are nestled thickly together in a mat of sphagnum moss and peaty soil, in a shallow container. we then placed this container in shallow water in my water feature, where the plants receive full sun. Because of the beauty of the blooms in May and the first part of June, we treat them as late-spring specimen plants and consider our mini-colony a focal point in our small water garden. From Paper to Focal Point: What's the Story With Papyrus?